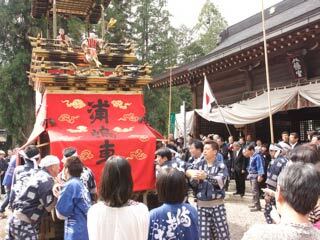 Minomatsuri Yama-Nerimono (美濃祭 山車・ねりもの) happens in the 2nd day of Mino Matsuri. Mino Minomatsuri is held in the middle of April. This parade float festival has been kept since Edo period. 6 huge traditional parade-floats with puppets assembled at Hachiman Shrine. Then, they demonstrate the performance to the god of the shrine. After the ritual reception, the float spins and runs back to their town. All these floats are registered as the folk cultural assets of Gifu. Date of the festival: 2nd Sunday of April. All of 6 Yama, the parade floats, have puppets which all made in Edo period. Between each Yama, there are Nerimono. Nerimono is a costume parade. Many people dress up themselves as the characters of Japanese fairy tale. The spinning in front of Hachiman Shrine is so dynamic and exiting.